08 Jan Participate in Kinected’s Food Drive! The holidays may be over, but for those at St. Peter’s in Chelsea, the season of giving is all year long. Kinected: How long has the food pantry been in existence? Rep:The food pantry has been in existence for the past thirty years. It began in response to fellow New Yorkers requesting food from the parish. The parishioners and the Rector responded to these requests for assistance. K: how is the food distributed, and what communities benefit from it? R: The pantry provides bags of non-perishable groceries for our clients, who come from various parts of the city, including Staten Island. The bags are given out on Wednesdays and Fridays from 10 -12 noon and on Saturdays from 11-11:30 AM. 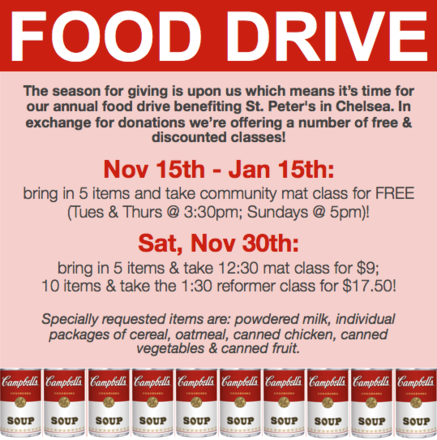 K: During what time of year is most beneficial to host a food drive, and how can people participate? R: Food drives are helpful at anytime of the year! We need volunteers to provide help in packing the bags of groceries, distributing the bags to our clients and assisting with client sign-in processes. K: what are some food items most needed by the communities who depend on the food pantry? R: Our wish list of needed items are: powdered milk, cereal, cans of vegetables and fruit, canned tuna or canned chicken or beef stew. We also need 1 pounds bags or boxes of rice or other pasta. Learn more about St. Peter’s Chelsea and how to participate in their Food Pantry here.